Charlotte's Webb - Tree of Life Theatre Troupe, Inc.
With 25 students, we had a wonderful camp once again! With each camper and staffer working their hardest with such diligence, it was clear that their dedicated work paid off with a fantastic show! On Sunday, August 9th 2015, at 3 pm at Freedom Park in Sykesville we held our final step in our charity drive! The heroine of Charlotte's Web, Charlotte, has 514 baby spiders, 511 of which fly away at the end of the story. 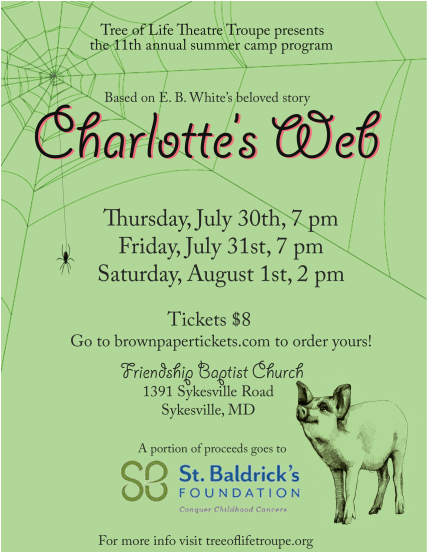 Our donation site for our Charlotte's Web proceeds was St. Baldrick's Foundation, an organization dedicated to childhood cancer research. Childhood cancer is different than the cancers that affect adults, and St. Baldrick's is dedicated to finding a cure for our little heroes. We had donations during the course of camp and our productions, and we decided to put those donations to action! For every donation, we attached a plastic baby spider toy to a balloon with information about St Baldrick's, the donation that was made, in who's name it was dedicated, and a message of hope. Wherever the spider balloon landed, the information had a call to action, urging whomever finds it to match the donation. We were able to raise awareness for childhood cancer, gather donations, and have a wonderful time sharing hope for the future to our community. Donations can still be made at the St. Baldrick's Foundation website! Thank you to all who joined our cause and helped to make a difference.